The CUSB is a low cost USB solution for TERN controllers. 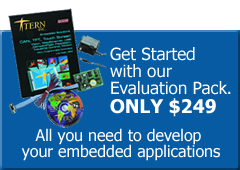 Many TERN controllers feature high speed ADCs, DACs, image sensors, and motion controls. Inevitably, user applications need to transfer data to a PC via USB at high speed. The CUSB interfaces to a TERN controller with high speed data bus. 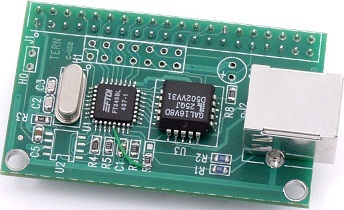 The CUSB integrates a high-performance USB stack chip to provide an easy to program USB 1.1/2.0 slave interface. The onboard hardware fully handles USB stack processing, and provides for high-speed bi-directional 8-bit parallel communication. The hardware interface includes 384 bytes of FIFO transmit buffer, and 128 bytes of FIFO for the receiving buffer, making this an ideal low-overhead solution for all embedded applications. The CUSB exposes a slave USB interface, and connects to a PC via USB-B connector. For connection to the TERN controller, the CUSB relies on the J1 expansion header compatible with most TERN controllers. No USB-specific firmware programming is required on the controller side. The USB interface is seen as a transparent parallel FIFO buffer tasked with transferring data back and forth with the remote host. The only control signals needed are ‘ready to transmit’ and ‘data received’ signals, readily available to your C/C++ application running on the TERN controller. Royalty-free software drivers are provided for most Windows environments (XP, 2000, NT, 98). These field-proven USB software drivers eliminate the requirement for Windows USB driver development. VCP and D2xx. The VCP (Virtual Com Port) driver supports up to 300 K bytes per second transfer rate, and allows the device to be accessed transparently on the PC side through traditional COM port software. The D2xx (USB direct driver and DLL) drivers can support up to 1M bytes per second. Additional utilities available from third-party sources allow the USB interface to be programmed with unique service and product ID numbers, allowing the unit to be transparently integrated into OEM applications. USB interface + USB B connector, default type B J1header.